My friend, Jenny, needed a card for her aunt so I volunteered to create something for her. I started with a piece of patterned paper from the Perhaps line by Basic Gray. 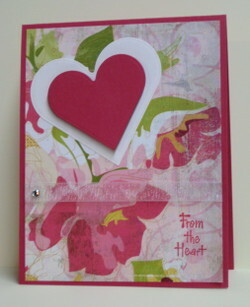 I noticed that the rose color perfectly matches Rose Red by Stampin' Up so I used Rose Red card stock for the base. I stamped the sentiment in Rose Red on the patterned paper, added organdy ribbon and a Swarovski crystal and then layered it on the card base. The heart shaped Nestabilities dies were used to cut and emboss the the white heart and the smaller Rose Red heart which was layered using a foam dot. Click on the photo for a closer view. All card stock, ink and ribbon by @Stampin' Up. Sentiment by Hero Arts. I'm waiting for the 7 to 9 inches of snow that is supposed to fall on the St. Louis area. The weatherman refined his prediction of "four or more inches" to "7 to 9 inches...leaning toward the high side." I'm glad I scheduled a vacation day for tomorrow. Anyway, we currently have about 3 inches so far and 2 of those inches fell earlier today...yep, I actually drove my Miata home in the snow. Yikes! I certainly didn't Zoom Zoom. Today at noon, it was 73 degrees. In fact, we set a record. Three hours later, it was 30 degrees and snowing. I kid you not! That's just crazy. Oh well, I guess I shouldn't be surprised. That's St. Louis weather for you. We're supposed to get significant snowfall late Thursday night into Friday morning. The weatherman defines "significant" as four or more inches. That's significant enough for me. I'm taking a vacation day and staying inside. We went to the St. Louis Auto Show yesterday. We haven't gone to the Auto Show for at least the past 4 or 5 years, mainly because we haven't been in the market for a new car. I guess we're still not technically looking to buy a new car this year (unless I can convince Bill otherwise) but I definitely know what my next car will be....the Pontiac Solstice. The first time I saw it was on The Apprentice several years ago when it was first released and I've been seriously considering it for my next car ever since. I had never sat in one until today and I must say, I looked darn cute sitting behind the wheel...hee hee hee. I also looked at the Saturn Sky which is basically the same car since they're both made by GM but I think the Solstice felt more comfortable and there seemed to be a little more room. I thought I might be interested in the dark blue color but after seeing the silver, I really want the silver. I guess I should test drive one soon. I'm sure it drives as great as it looks! Another car I really like is the Cadillac CTS. I told Bill that this will be his next car...hee hee hee. That way, I can drive it but I'll still have my two-seater convertible. After the car show, we went to Lumiere Place. We each lost $20 (big gamblers) and then went to Morgan Street Brewery for dinner. They had the gorgonzola ravioli and beef tips as a special again! I absolutely love this dish. They should just add it to the menu so that I could order it every time I'm there. We each had a Harvest Lager and we bought a growler to bring home. A three alarm fire broke out at the Monte Carlo Hotel in Las Vegas today. The top four or five floors were on fire. Initial reports state that most of the damage was on the outside of the building. Luckily there were no serious injuries. The Monte Carlo is home of one of my favorite microbreweries, The Monte Carlo Brew Pub...love the High Roller Red and the Silver State Stout. My friend, Jenny, and I are supposed to be going to Vegas in April and guess where we're staying? Yep, the Monte Carlo. I'm sure all will be well by then. Here is the Me and My Pet ATC I mentioned in previous posts. I had a completely different layout in mind when I started but it just sort of went in a different direction. I started with the picture of Greta (also know as Greta Jade, Greta Jade Nala, Gret Gret, Baybita, Fluffy Fresh, Muffin, Baby, etc.). 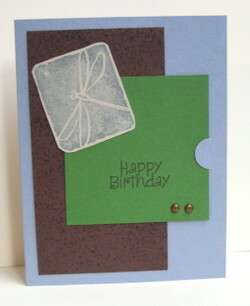 I started with white card stock from Papertrey for the card base. Greta's eyes usually appear gold in pictures so I decided to use this paper (now retired) from @Stampin' Up because the color matches her eyes. 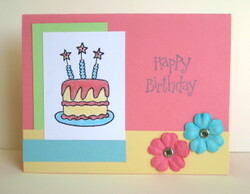 I added ribbon before attaching the paper to the card base. I punched out the photo with the Marvy Uchida jumbo scallop punch and layered it on the paper. I used the @Stampin' Up photo corner punch to create a photo corner from Certainly Celery card stock. A brass brad was then added. The sentiment is by Amuse and was stamped in Chocolate Chip ink. Paper, ink and brad by @Stampin' Up. Ribbon unknown. 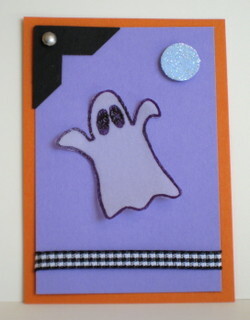 Yes, I know that it's not Halloween but I forgot to post this ATC that I made in October. The only specification was that we use vellum. I had bought this cute ghost stamp when I was in Seattle so I thought it would be perfect to use for this creation. I started with Pumpkin Pie for the base. I cut slightly smaller piece of Lavender Lace and added black gingham to the bottom and then layered it on the base. I stamped the ghost image on vellum in black ink and then used clear embossing powder. I cut out the ghost and attached him to the ATC using vellum tape behind his eyes. I then slightly curled the edges so it appears that he is flying. For the moon, I punched a 1/2 inch circle out of Bashful Blue card stock and embossed it with Irridecent Ice to make it sparkle. I used the @Stampin' Up photo corner punch and then added a silver brad. All card stock, ink and accessories are @Stampin' Up. Image by @Savvystamps.com. I love the Amuse square note cards. Some of the colors coordinate quite nicely with @Stampin' Up colors. 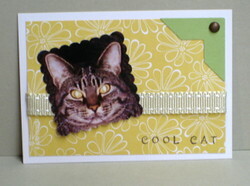 For example, this card was made using the Amuse Mango note card and it matches Apricot Appeal almost exactly. I stamped the image on Whisper White and then colored it with my Certainly Celery, Apricot Appeal and Regal Rose @Stampin' Up markers and then added Dazzling Diamonds to the candle flames. I punched the image with the Marvy Uchida mega scallop punch and layered it on the card. The sentiment was stamped in black and then a piece of Certainly Celery ribbon was added...a very quick and easy design. Image and sentiment from the Hero Arts set designed exclusively for Archiver's. The only problem with square cards is that they require extra postage to mail. Since these Amuse note cards will fit in a standard A2 envelope, you can avoid paying extra postage by placing a piece of decorated card stock inside the envelope to fill the empty space. Of course if you're going to give the card to the recipient in person, postage isn't an issue. I just checked the Amuse website and I don't think they carry this particular note card anymore. They also don't carry the Kiwi note cards either and that was my other favorite. I guess I'll have to hoard the ones I have left...hee hee hee. I made this card for my friend Jenny's granddaughter. She likes pink and blue and I had found these flowers at Target so I figured that they'd be a perfect addition to this card. I used Regal Rose for the card base and added a strip of Barely Banana to the bottom. I then added a small piece of Green Galore on the left side. 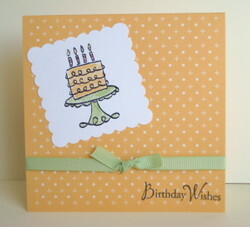 I stamped the cake image from the Gina K set called Make a Wish and colored it with my @Stampin' Up markers. I added Crystal Effects and Dazzling Diamonds to the icing and small Amuse twinkle stickers to the star flames. I then layered the image on top of the Green Galore piece and added a small strip of Cool Caribbean underneath. The sentiment was stamped in Cool Caribbean and then added the flower to complete the design. Card stock, ink and sentiment by @Stampin' Up. They haven't announced the "kids" show yet. Each year, they have a show that is produced with kids in mind; Wizard of Oz, Cinderella, Sleeping Beauty, Annie, etc. I'm hoping for Cinderella because we've only seen it at the Muny once and that was in 2003. At the end of each season, Muny attendees get to vote on which shows should be produced in the following year. You can click here to see our votes. By the way, I won 2 to 1...yeah me! We both picked the Producers and I also picked Fiddler on the Roof. The final score may be 3 to 2 if they choose Cinderella because we both voted for that one too. The Muny season doesn't even start for another 5 months but, the way time flies, it will be here before you know it.